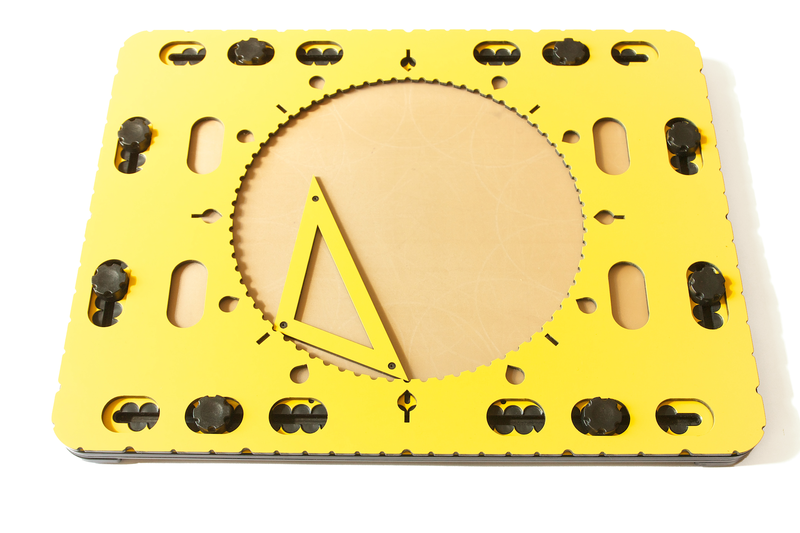 The small triangle tool is intended for your own drawing templates out of cardboard or other sturdy material. The sides of the triangle have specific lengths. If you place one of them against the edge of the circle in the CircleFrame, they exactly span an arc of 45, 60 or 90 degrees. By rotating the triangle respectively 8, 6 or 4 times along the circle’s edge, it will end up in the starting position again. When you give the side of your template one of these lengths, it will fit a number of times in the full 360 degrees of the CircleFrame too. Cutting out a shape from the center of your templates and using this as an outline allows for infinite variation in shapes and patterns. Recurrence and/or partial overlap will give your drawing even more appeal. When placed against the circle, the degree indications can be used to determine the amount of rotation and overlap of the patterns. Figure 1. The small triangle tool is placed along the edge of the large circle.